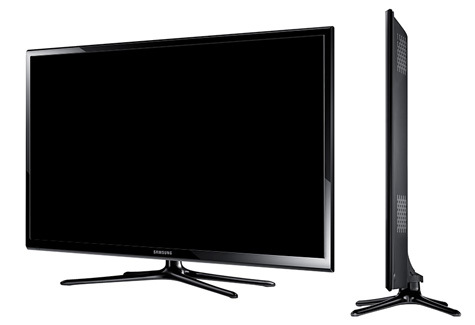 The Samsung PN64H5000 plasma TV is a replacement for the F5300 series from 2013. It's about as basic as it gets for the display tech that getting a little harder to find these days. It features a full HD 1080p display with a few picture quality features to enhance the overall image. That's about it. No smart TV features or 3D playback are present on this model. This puts the TV in a perfect spot to keep the price down and the value rating up. This model aims to be a solid value starting at around $1,400 for the huge 64-inch size. The Samsung PN64H5000 aims to be a value oriented plasma TV that provides a the natural and warm picture quality that plasmas are known for. Samsung plasma TVs have one of my favorite picture renditions among all TVs today. Color reproduction is accurate and has a wide range thanks to the Wide Color Enhancer Plus. Screen reflections and picture brightness are the two downsides in picture quality on the 64H5000. The overall picture can be a bit dim and the light flow through isn't as powerful as we have seen in top tier plasma TVs. These two factors make it hard to place this TV in a bright room where ambient light levels cannot be controlled. In a controlled lighting environment, the PN64H5000's full HD picture quality is excellent for the price paid. The PN64H5000 takes notes from the flagship models of previous year's deep blacks with good detail in dark scenes. The blacks certainly won't measure up to current OLEDs, but are strong nonetheless. Plasma TVs have always had the advantage when it comes to black levels over LCD/LED TVs and we are happy to see a few available this year. We always say that a good calibration yields the best picture quality that a TV is capable of. That is no different here. After calibration, colors on the 64H5000 are very natural and true to life. There aren't any problems of over-saturation or colors being too bright. The Color Tone setting is perhaps one of the most important settings to get right when it comes to color. A setting of Warm1 is going to muster up the best color performance. Best means most balanced in this case. The Warm2 setting,which we normally use, really pushes green into the picture. Warm1 really looks the best on this plasma TV. Plasma TVs are usually recommended as gaming TVs, but Samsung's plasmas has a hard time with input lag. Even with the Game Mode enabled, our tests showed input lag at anywhere between 70 and 100ms on the PN64H5000. That's a little bit more than the target levels. It is important to note that I didn't think it was terrible. Gamers who mainly play First Person Shooters will probably notice it a good deal more as precise input is required. A dedicated gaming TV should probably be found elsewhere. The Game Mode can be found here in the menus: System > General > Game Mode. Sound quality is not the forte for the H5000 this year. Volume is plenty loud and will fill a room, but the range isn't very strong. The two 10 watt speakers end up sounding hollow and empty and voice gets overwhelmed by background noise and music. For a point of reference, speakers on LG TVs are an example of what good TV speakers should be. The 64H5000 will really benefit from a home theater setup or a sound bar. Sound quality scores a 6 out of 10. The PN64H5000 is nothing new to when it comes to the design of Samsung TVs. The black plastic quadrapod stand is something we have seen before. There seems to be a mixed reception when it comes to these stands. If it isn't for you, wall mounting is the best option. The bezels aren't as thin as you'll see on an LED TV, but that is par for the course when it comes to plasmas. It's not as flashy as the futuristic design of last year's F8500, but it's modest design works well. The TV has a thin profile of 2.2 inches in depth. 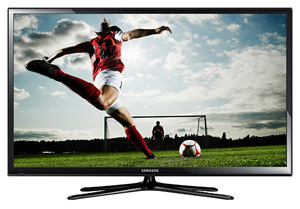 Considering there aren't too many plasma TV options this year, the PN64H5000 comes out as a strong value. Picture quality afficianados will be happy to have a plasma TV in their home theaters, but they are not always best for rooms with lots of ambient light. The price for a huge 64-inch plasma screen starts around $1,400. Comparable LED TVs like the Samsung UN65H6350 or the Sharp LC-70LE650U sell for a little more, but offer more features. TV without Stand (W x D x H): 58.2" x 2.2" x 34.3"
TV with Stand (W x D x H): 58.2" x 14.8" x 38.1"